On Saturday April 15, 2017 we crossed from the southern hemisphere into the northern hemisphere at where else but The Equator! A momentous event as we finished the southern half of the globe and transitioned closer to our home hemisphere. It also occurred to me that we also transitioned from fall to spring in one step. Ha, how cool was that? Since we left Seattle before the first day of winter we managed to totally skip winter 2016/2017. I’ll take that. 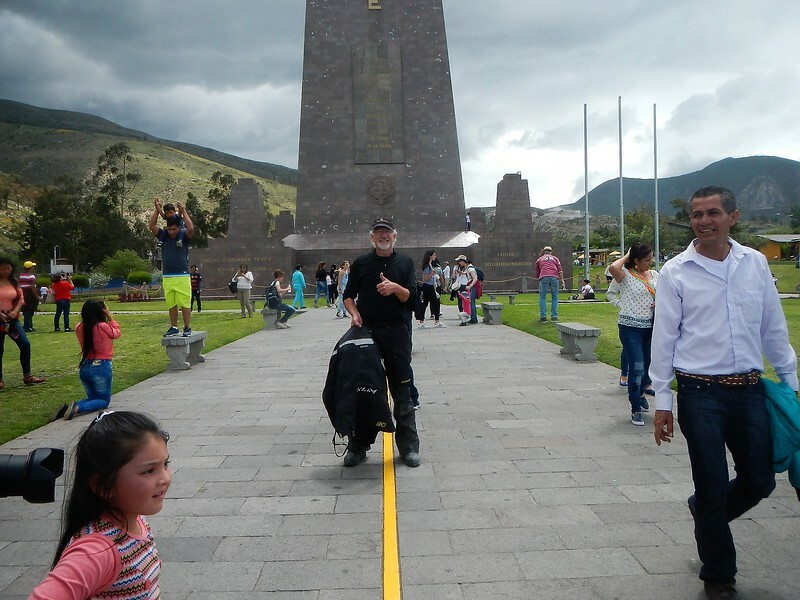 We were near the capitol city of Quito so we decided to stop at a huge park they have celebrating the equator crossing. I had heard there was buildings with scientific displays and other interesting things so it seemed worth checking out. It was a holiday weekend and the place was packed with tourists enjoying what was very similar to a Disney like theme park. When we arrived on the fully loaded bikes we found parking but needed to take time to secure the bikes and trek off in full riding gear into the 80+ degree heat. We waited in a few lines to get in but finally got to the big yellow line that marks the equator. Here it is… the obligatory picture of me with one foot in the the northern hemisphere and one foot in the southern hemisphere. I felt a little tingly as my insides didn’t know which way to swirl with excitement. Check out the sky… sure enough, it started dumping rain so we ducked into a small restaurant that straddles the hemispheres to wait out the deluge. 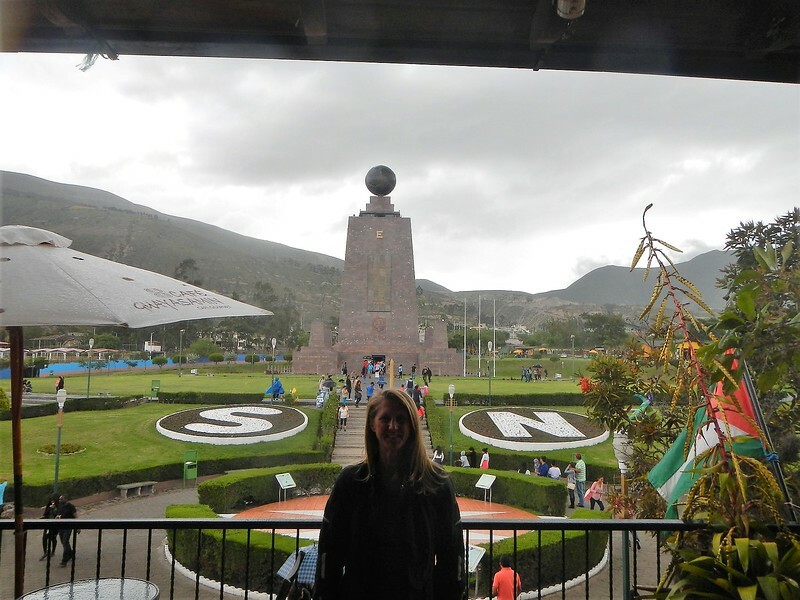 Here is Deby under cover at the equator. With the rain we realized we locked our helmets to our bikes bucket side up, what a rookie mistake, so we decided we had enough of the crowds, skipped the displays with the long lines and left to save our helmets before they filled with water. 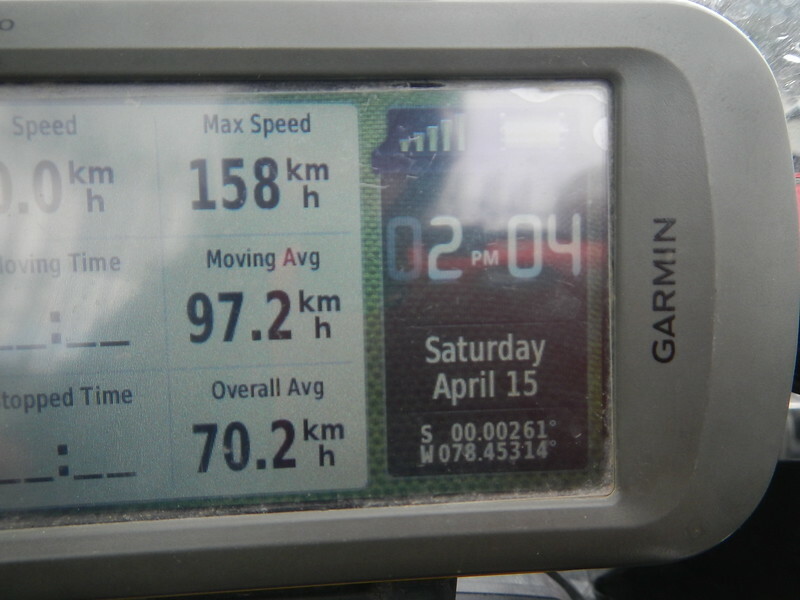 Here is a picture of the GPS, on the lower right you can see the coordinates. You might ask, hey… why does south say 00.00261 and not just zero? Well, we learned at one of the interpretative signs that the equator actually moves as much as 8km because the earth is wobbling a little. Wait, would my GPS detect that?? Was the yellow line a scam? Not sure but here it is, probably global warming. We did another fun thing in Quito. We caught up with our friend Dave Coe. Dave had been travelling for about 6 months from Canada south. He visited our house as he went through Seattle and we caught up with him again at the September Horizons Unlimited meeting in Seattle. We’ve been keeping track of each other as he traveled south and us to the north. 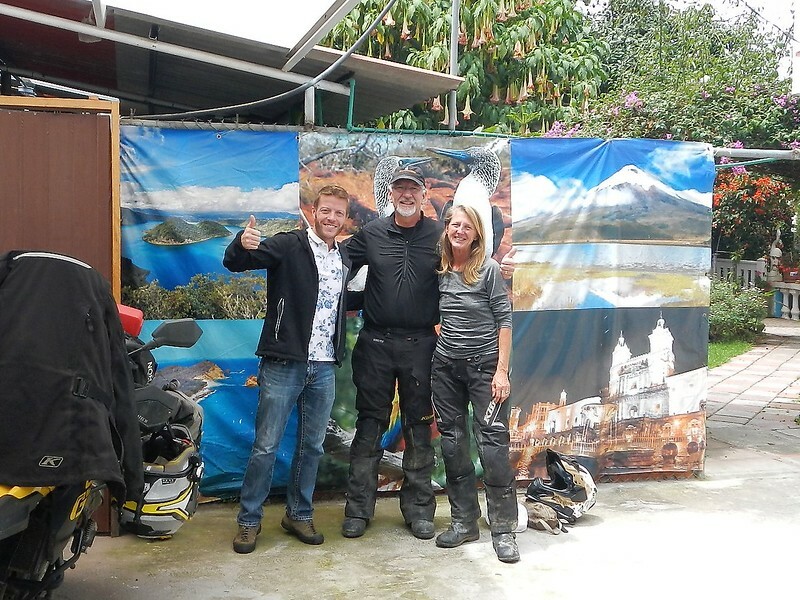 I got a message when returned from Galapagos that he was in Quito to ship his bike home and would be there one more day. The timing was perfect, we managed to run to the capital city and catch up for an evening of beer and pizza with Dave. It was great to see a familiar face and we had a fantastic evening. Dave is taking a “break” from his trip to…. get married! Yea! Congratulations Dave! Go home, take care of business and finish your trip as a couple, it’s a great way to go. Back on the bikes from the equator we only had a couple hour ride north to one of our favorite spots, the Puerto Lago Resort. 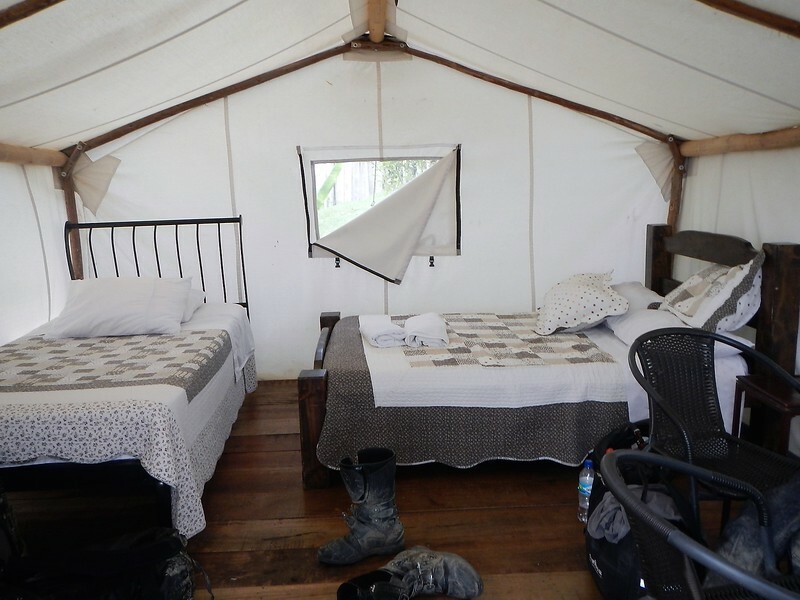 We had stayed there on MotoRaid II four years ago and we were glad to get back. Nice cabins right on a lake. 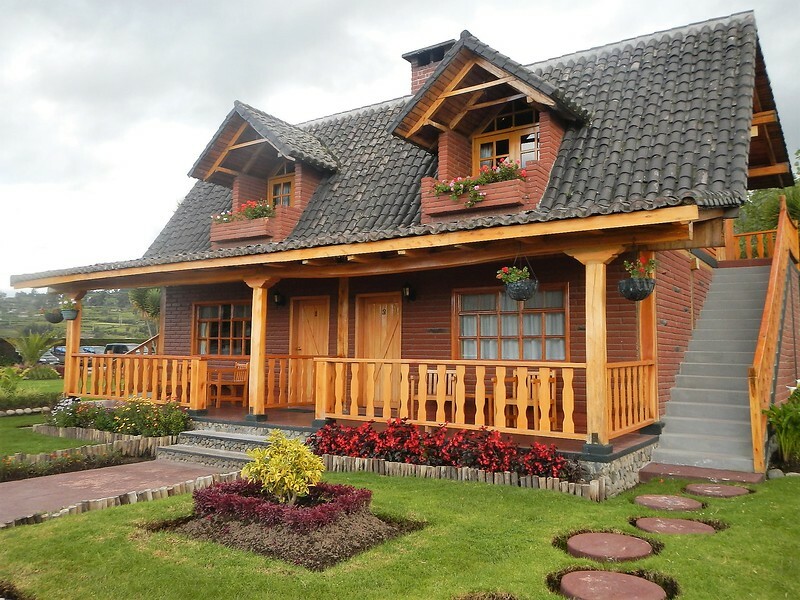 We stumbled on this place on the outskirts of Otavalo last time. Frustrated in our attempts at finding a hotel near the city we all stopped along the two line highway and decided to split up and “scout” for hotels. I can’t remember who, but when we reconvened I think it was Dave or Keith said they found a place down the road, this was it. Good job. The only change from four years ago is that now that crumbly 2 lane road is a nicely paved 6 lane highway! Crazy. 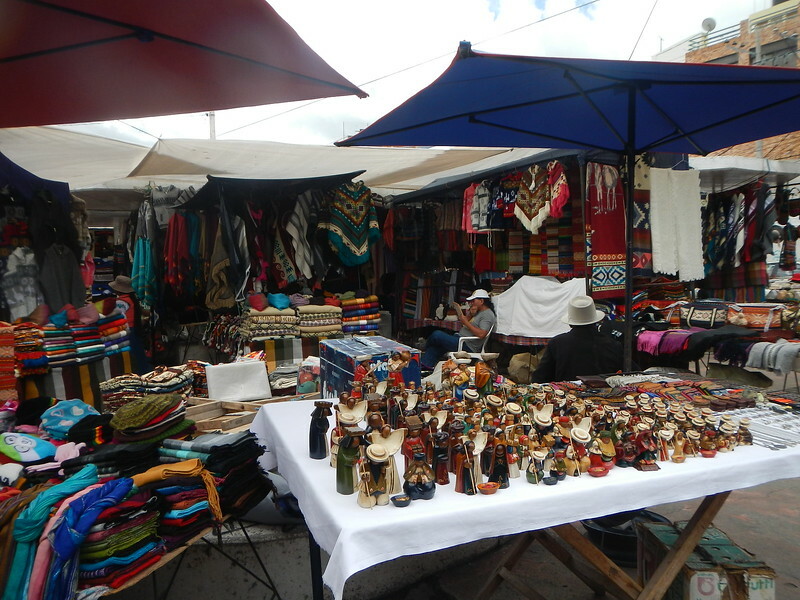 We decided to stay two nights and spend a day in Otavalo at the famous fiber market. 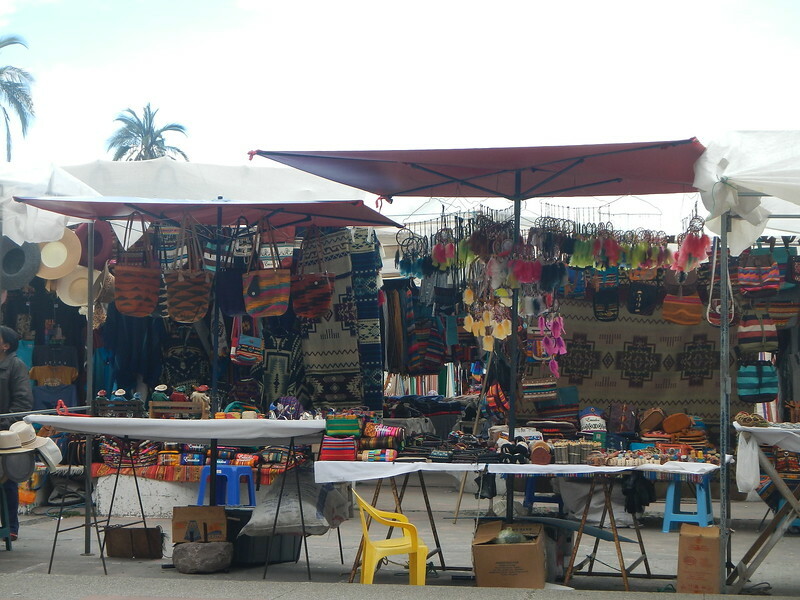 It was a beautiful day and we had the day to wander the stalls, have a nice lunch and relax in the city. 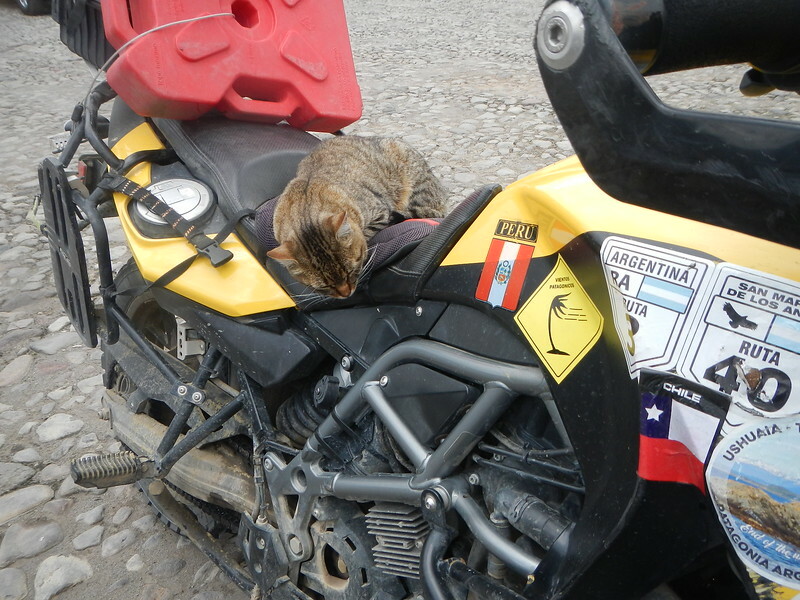 We came back to find a friend on Deby’s bike, must be that cushy AirHawk seat cushion. 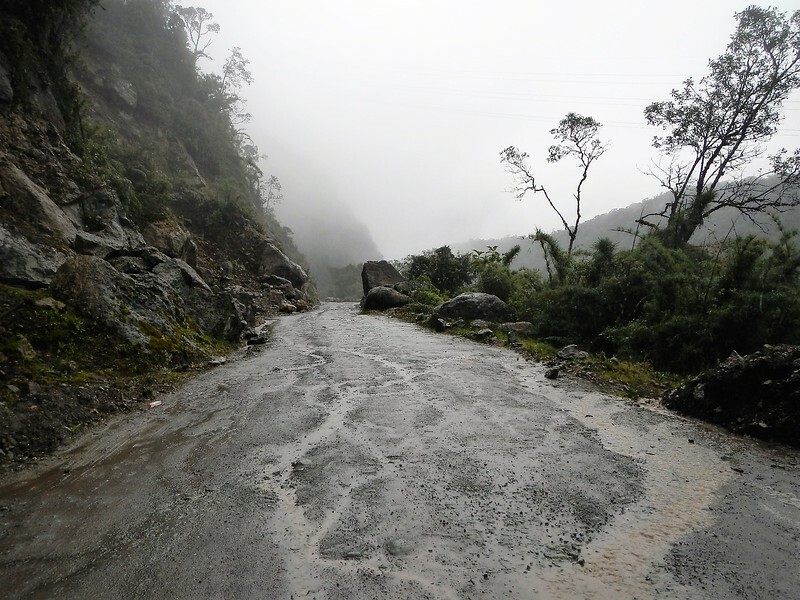 Into Colombia – Rain, mud, floods. 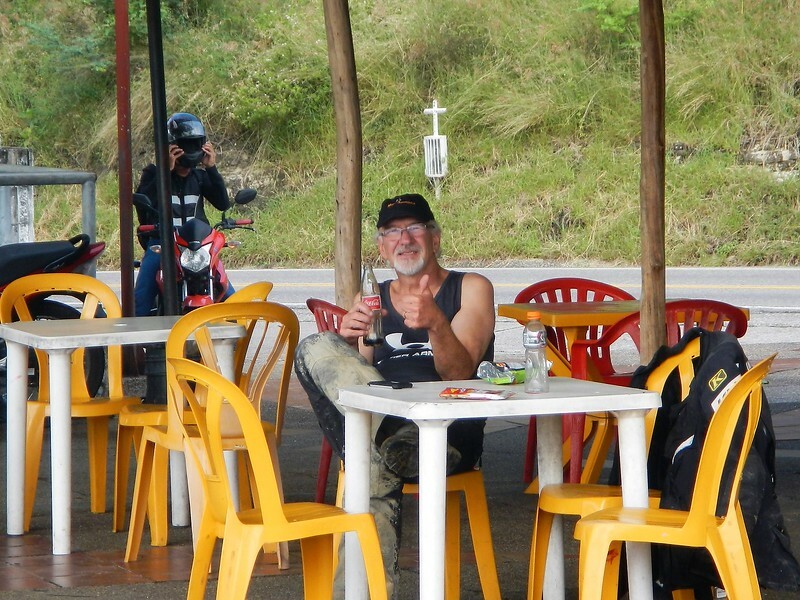 Monday April 17, 2017 we made the short ride north on the newly paved Pan-american Highway to the border crossing into Colombia. To date most of the border crossing have been pretty easy, this one took a few hours. Exiting Ecuador was easy, stamp stamp and we were out. 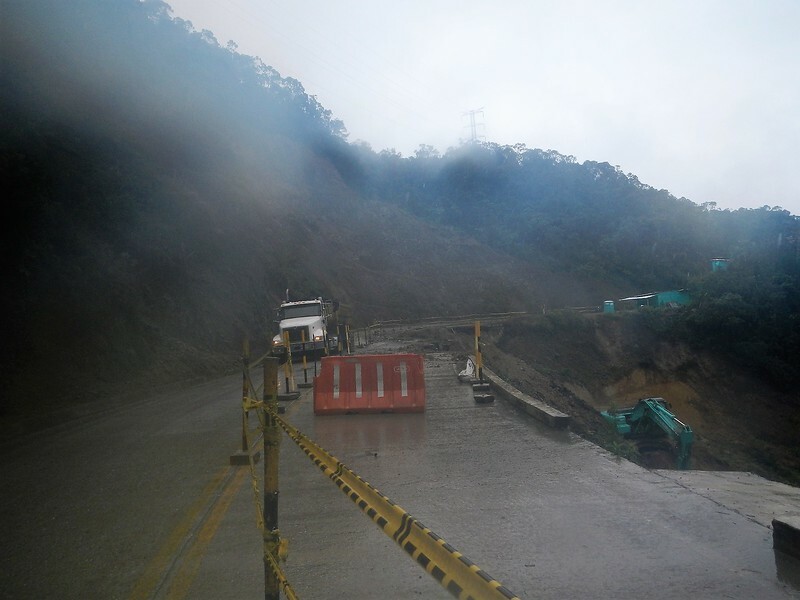 Then we ride across a bridge and go through the process getting into Colombia. Passport stamps for us and them paperwork, forms, copies of everything at a store down the street then wait until 2:00 when the office reopens after lunch then inspection of the motos, more forms and finally we were off. Good practice for what will be ahead in Central America. 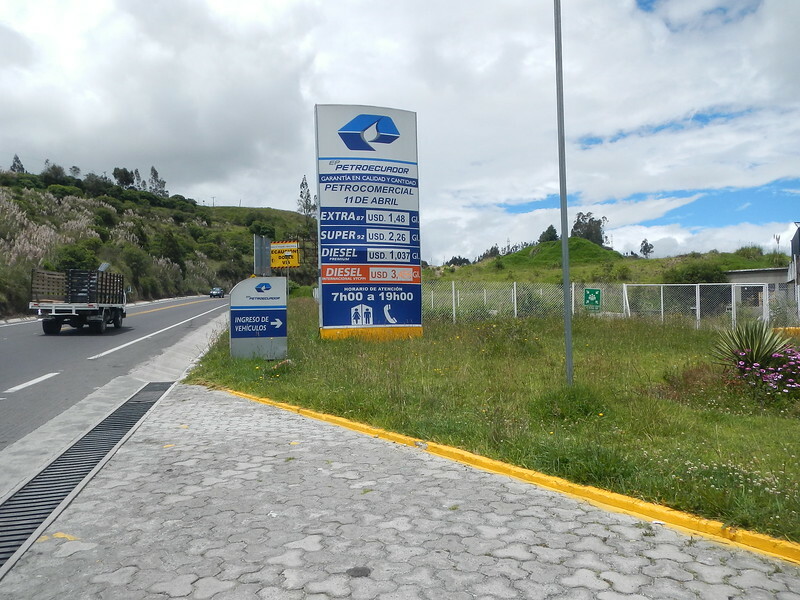 Here is one last picture from Ecuador, something we will miss… cheap gas. These prices are US dollars per gallon $1.48 for regular. Haven’t seen that in the US for a while. 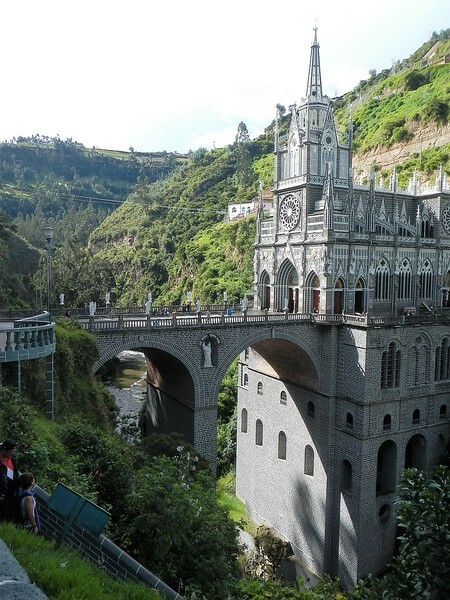 Once across the border it was a short ride to Las Lajas Sanctuary a basilica church built in a canyon of the Guaitara River. A worthwhile stop even if it again meant a long hike with riding boots and gear. 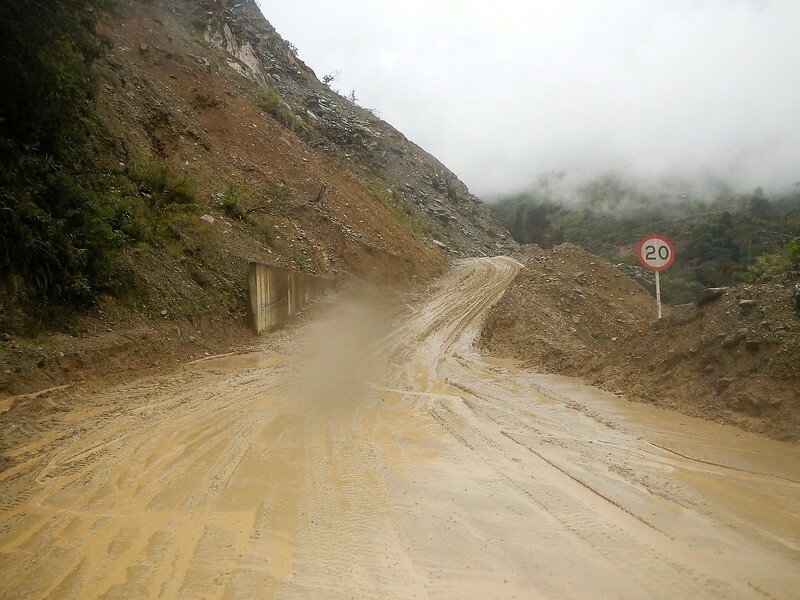 After a nondescript night at a small but new hotel in Ipiales we had a decision, ride north on the panamerican highway or make a turn to the east to ride on the “infamous” Trampolin del Diablo – one of the most dangerous roads in South America. 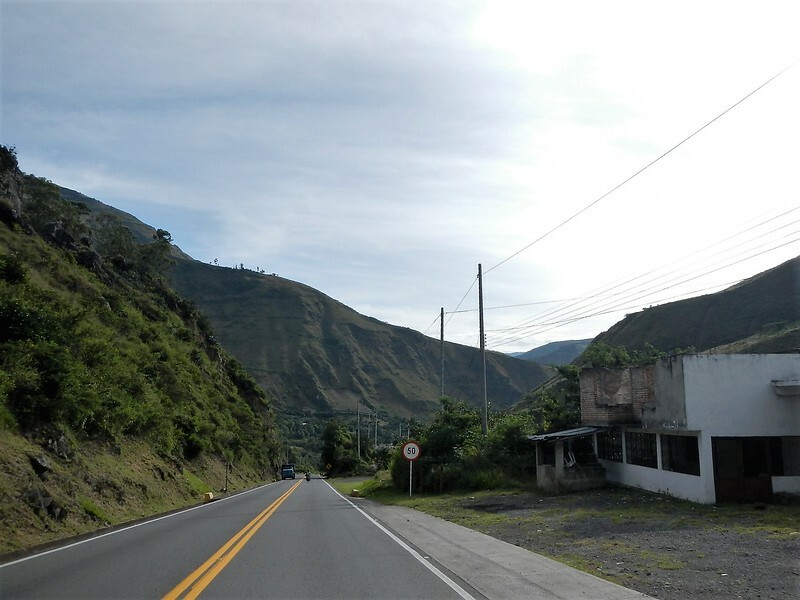 The road goes from Ipiales to the city of Mocoa to the east. 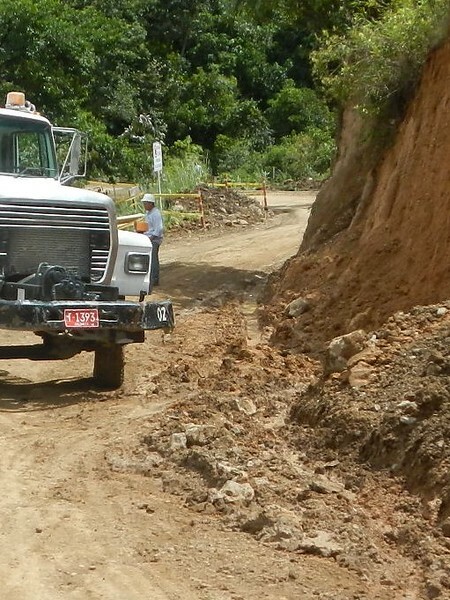 However, things were not good in Mocoa, only a couple of weeks ago heavy rains had caused a landslide in the city. Here is the headline and link. 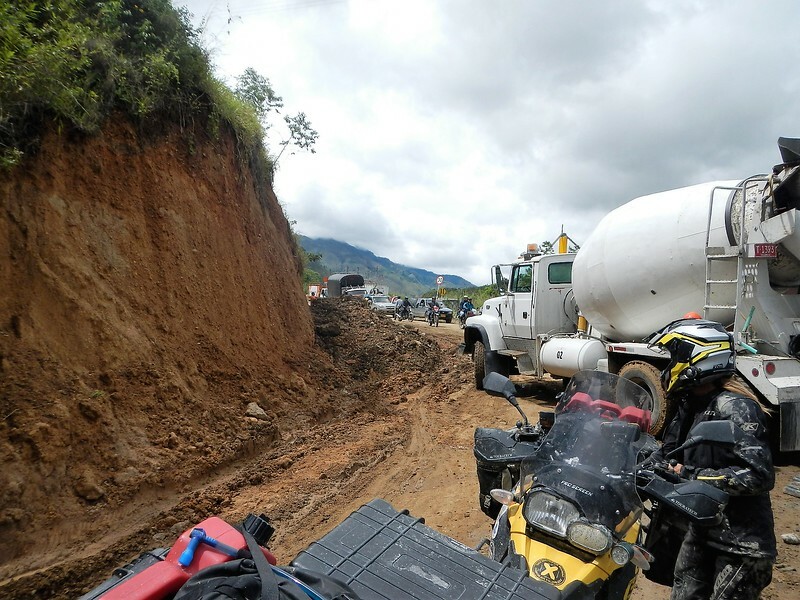 Even on the main highway there were dozens and dozens of landslides and washouts in the road, otherwise Colombia had beautiful velvet hills and generally good roads. A few interesting things… what does this sign on the right mean? And where is this guy going with dress pants, white rubber boots and a bag of bananas tied to his rear seat? 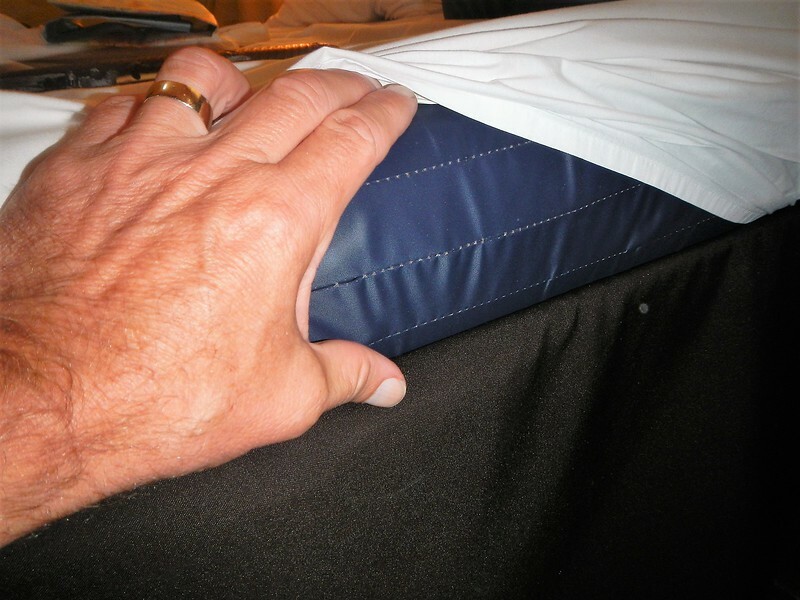 And does this mattress seem thin to you? 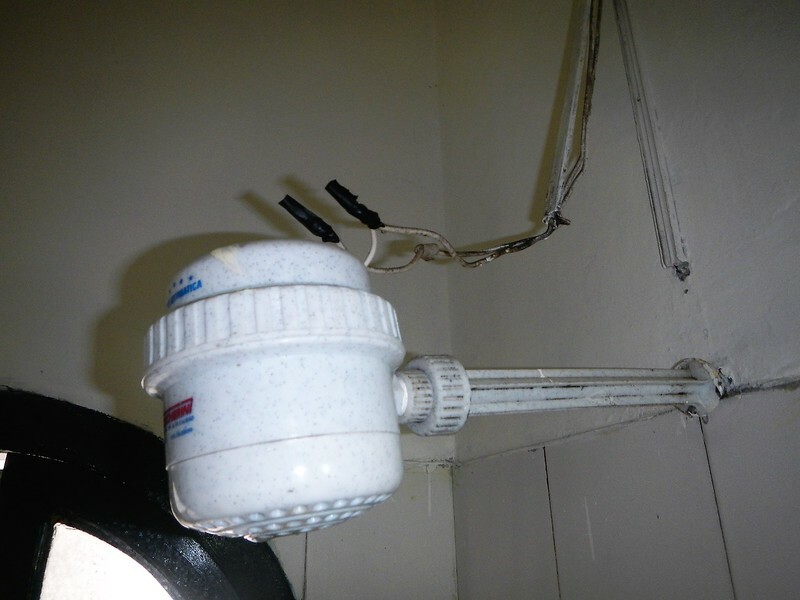 Or, any danger with the hot water system here? 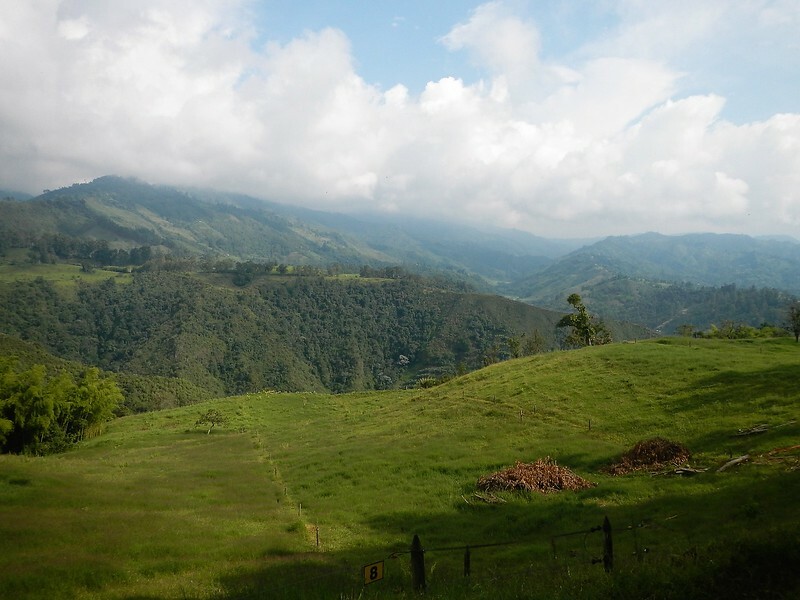 We decided to take a chance and hop off the panamerican highway to jump over a mountain range and ride north on the valley on the other side. Our paper map seemed to recommend a main highway 20, over the mountains through the tourist town of San Agustin. Google Maps, on the other hand recommended a shorter route through the cities of Inza and La Plata. The road wasn’t even on my map but … maybe it’s new? Well, you can guess what happened. Soon after we left it started raining and the road was mostly under construction. 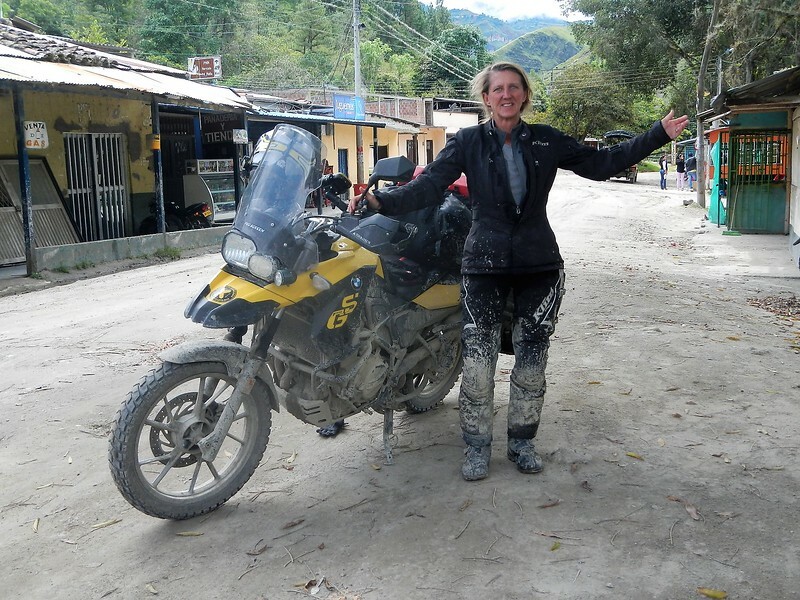 Where it wasn’t new road it was….. MUD! So another day of riding in the rain and mud. Here is Google’s recommend road…. Dozens of these washouts and slides. We came across this construction road block. 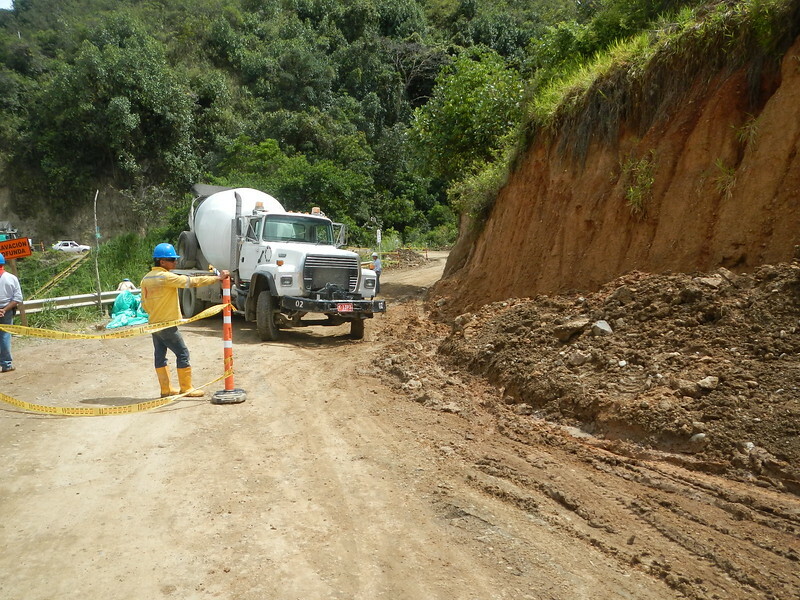 We could wait 2 hours for the cement truck or….. hey – can fit around to the right? All in a day’s work, slick, deep and rutty but we made it. So much for clean bikes. 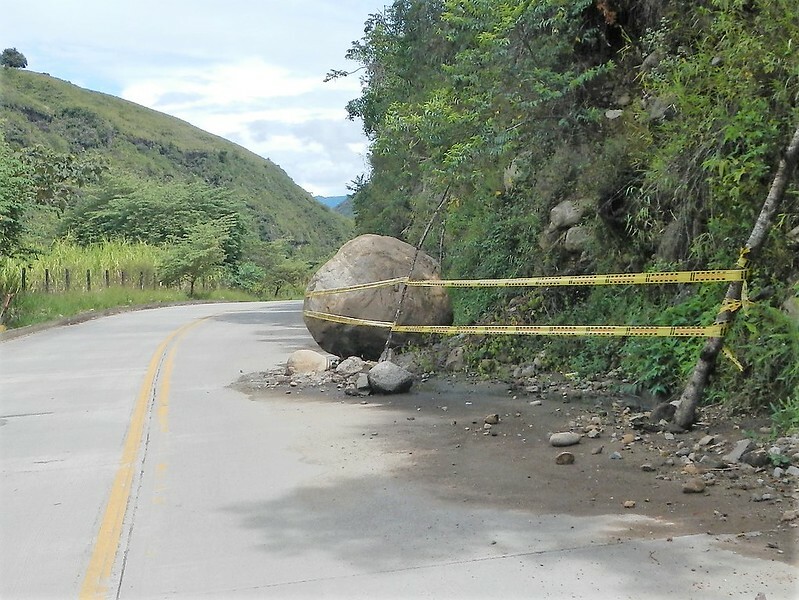 Like I said there were dozens and dozens of slides across the roads but this was my favorite… now that’s a boulder. As is our tradition we stopped towards the end of the mountain range for lunch/snack at a gas station. We ended up in the city of Neiva where I assume not many tourists go. We found a hotel near el central and went out for a walk looking for food. 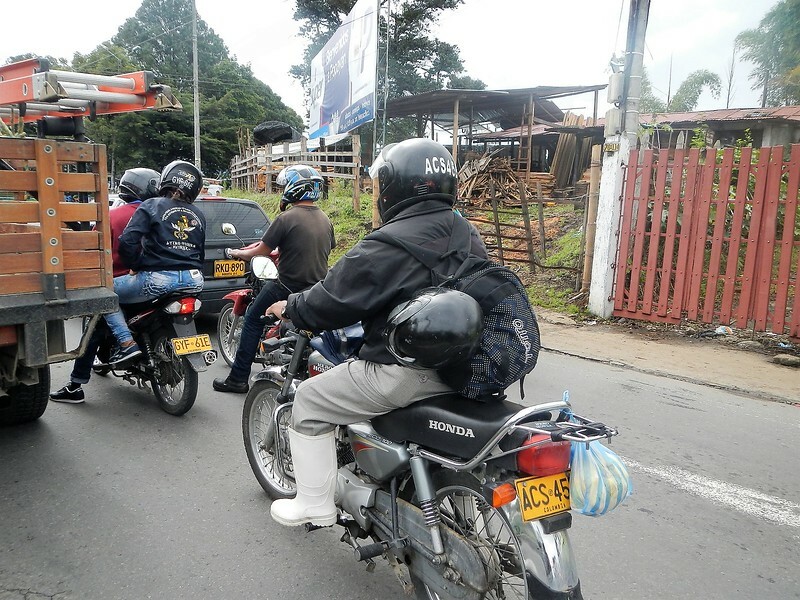 We came across about a 5 block area that was 100% full of motorcycle shops. You could buy anything there. There were shops specializing in anything motorcycle related. The really interesting thing was that many of them had hawkers hanging out the front doors trying to get us to come into their shop to look around… look at our helmets! Look at our headlights! Look at our jackets! Different, that is for sure. 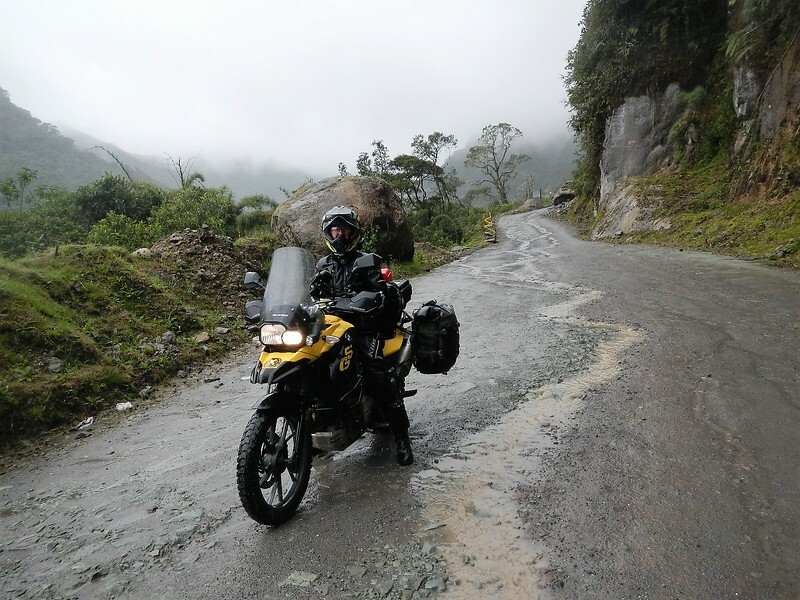 Thursday April 20, 2017 Neiva to Giradot. Whew, back on a main highway we had an easy ride to the city of Giradot. We decided to revisit another hotel from our last trip down The Girardot Resort Hotel. I remember it was ok last time with a nice pool and peaceful. This time NOT. Basically, the Easter holiday was still going on down here and the place was packed with families and small children. Since we had been there last it became an all inclusive hotel and we were given wristbands for free food and beer. Sounds good right? No. We had two nights booked so we decided to make the best of it. In the evening after dinner I started to feel sick… dang. I know that feeling, something I ate? Dehydrated? Didn’t matter I spent the whole next day in the room near the bano. I still wasn’t feeling well so we asked the desk at the resort for another day, nada, nothing, full. I was sick of the place anyhow (ha) so Saturday morning we packed up to ride north. It was 85 degrees and sunny when we got on the bikes. I was plenty hot under my riding gear in the sun but not sure if it was the sun or my infirmity. Deby was a rock star and found a place online that she heard about Hostel La Serrana in Salento. It was a short ride into the mountains. On the way we rode the famous route La Linea or The Line. I wasn’t really in the mood for more challenging riding but it was the weekend so it wasn’t as bad as I remember it from 4 years ago. It’s all paved but the tricky part is the miles and miles of really tight turns. I didn’t take many picture but have some videos, challenging and fun. Home for the next three nights….. ah. What a place to recover. Here is the beautiful view out the deck. A wonderful stay. 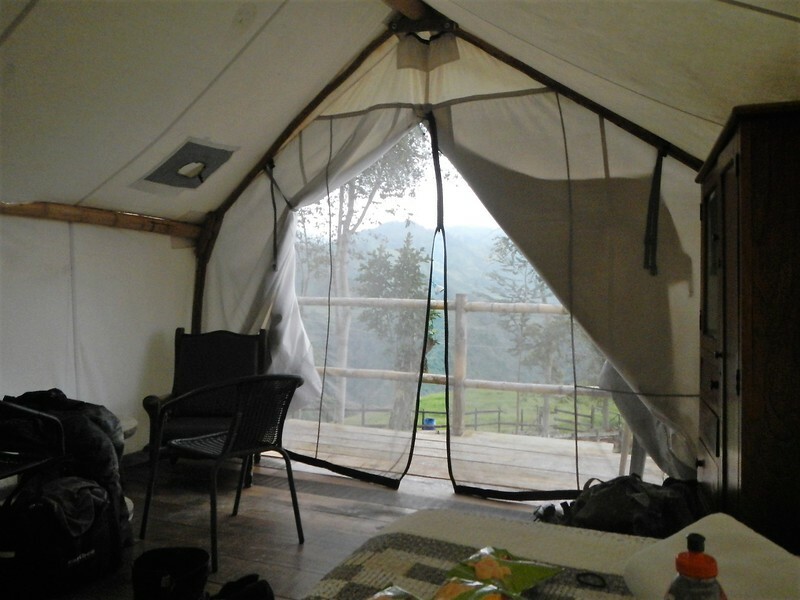 We (I) slept, read books, slept somemore and just hung out looking at the views. Every day thunder storms complete with lightning and rain pushed through the valley alternating with sun and then more rain. The lightning and rain felt like it was right on top of our tent at times and we just hunkered down. The temperatures were perfect and there were few bugs. I just wish I felt well enough to really enjoy the area. We literally just stayed put… a vacation from our vacation…. Tomorrow… in sickness or health we ride north. I am so proud of you guys getting to glamp in a tent… otherwise, it sounds like a pretty ho hum of a trip…. not! With all your new found experience in off the road, wet & muddy are you going to do the Darién? So, the current fashion is Sleeveless Not in Seattle? After our recent trip to Mexico I was also wondering about the effects of local water and gas station/road side food on the gringo carcass. Question not even asked but answered. Continue to explore, enjoy and stay safe! A great blog … So funny …the guy with white boots and bananas ! What the ? So good to hear more of your adventures ! Too bad about the diarrhea spell … Must have been the wrist band !! Enjoying your blog …. Thanks for a phenomenal blog showing us all the wonderful world we live in. Places so few of us will ever go. You are true adventurers! Great stories and pics as always. 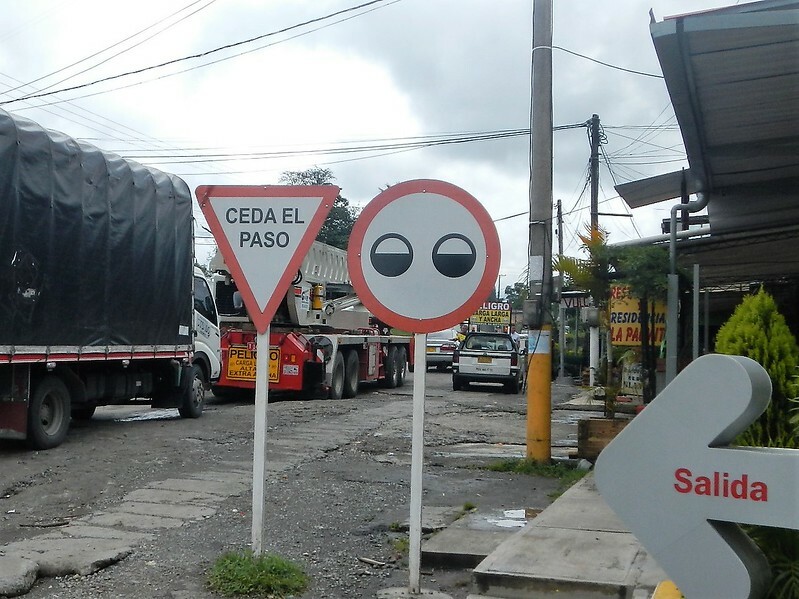 Now I’m curious about the road sign with big eyes LOL! Did ya know you could of stayed home and rode in the rain n mud? Just kidding, the jungle and beaches in between are awesome! So quite the towing experience right? Hasta la proxima amigos! Espero que vamos hablar en puro espanol cuando regresas de tu viaje! OK, I need a Spanish keyboard…..
Glad you two made to back safe and sound. don sell that used Honda bike asap.